Idaho. March. Zero degrees at 7 a.m. But that doesn�t stop the locals from gearing up and making their way on two wheels to Happy Trails retail store for an all day presentation in Garden City on a Saturday morning at 9 a.m. The sticker most prominent on the bikes in the parking lot - "Paved roads are just another example of wasted tax payer dollars." That's the Happy Trails mantra. Since 1989, Tim and Sherry Bernard have been working hard every day to build a business that takes care of riders as well as themselves. The kind of loyalty the Bernard�s have procured over the years has been a slow build based on practical products that work and a willingness to stand behind what they do day after day. 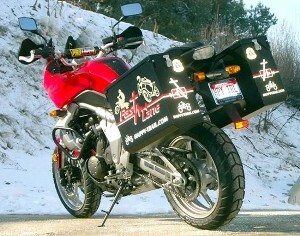 Today Happy Trails is best known for its quality line of hard luggage and mounts aimed at the adventure rider market. From small 30 liter panniers and 60 liter top boxes you could fit two full size helmets into, to engine guards and highway bars, Happy Trails has been designing and now defining the adventure accessory category. For those looking to secure their gear in a hard shell box, the HT line of boxes makes a lot of sense. They allow a traveling rider to feel far more secure leaving their luggage on their bike than if they were using textile or leather luggage. This becomes an even more critical issue if you�re traveling through a foreign country such as South America. Happy Trails boxes may not be for everyone though. The process begins when Tim Bernard selects a make and model to produce a supporting frame for. Without that, the boxes can�t be mounted. In the beginning that meant supporting frames were developed for BMW adventure models and the Kawasaki KLR. But over the years other adventure and dualsport bikes have come to the market including the Suzuki DR400 series, V-Strom and now Kawasaki�s new Versys model. With each new model, Bernard makes the decision of whether or not to proceed with the costly frameset development. Today Happy Trails has support frame systems for more than three dozen models of dualsport and adventure bikes including Honda, KTM, Buell, BMW, Suzuki, Kawasaki and Yamaha. And like so many businesses, Happy Trails morphed its way to where it is today. They originally began in 1980 by purchasing Drive Line Service, a company specializing in manufacturing and repair of drivelines for industrial, farm, mining and automotive needs. As a sideline, Tim began building trail cleaning kits for the USFS and BLM. Through that it became apparent that storage for the trail crew gear was going to have to be dealt with and the first Happy Trails boxes were born in 1991. Above: A fully outfitted Versys that also sports HT's own line of engine guards. The Bernard�s produced their luggage out of a small shop in Idaho until it became obvious they could better serve their customers if they added retail items that suited those customers� needs. The first Happy Trails retail store opened in 2000 in the Drive Line Service Boise location in a tiny upstairs room stocking jackets, boots, pants, tire repair, tools, and other accessories. In 2002, the Drive Line Service was sold and the Bernard�s took a leap of faith and went into Happy Trails as a full-time business in a warehouse in Garden City. The store had to be moved to a new larger location in the Garden City area of Boise on Chinden Boulevard. Over the years, the Bernards have expanded their marketing to include appearances at various BMW rallies, the Seattle and Spokane motorcycle shows and Dualsport Northwest. 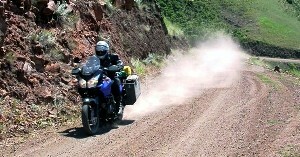 For the last two years Happy Trails has provided a very informative "Gearing up your dualsport" seminar at the latter. For Tim Bernard, it�s important to keep testing the product and that is achieved through various trips throughout the year. From missionary trips through South America, to participating in Rawhyde�s Adventure Rider Challenge, Bernard spends a fair amount of time on the road putting the latest Happy Trails gear through its paces. And just how big has the company grown? Today Happy Trails employees 13 people including 5 full-time welders and turns out well over 500 sets of panniers each year. In 2008, Bernard has increased staff to try and lessen the backorders, but with the increased fuel costs people face, motorcycling is becoming more and more practical which in turn brings more people into adventure riding. It�s not just consumers that want in on the products produced by Happy Trails. Recently Bernard did retrofits for the Nampa Idaho and Baker City Oregon Police Departments and more such activity is expected. And while some may think imitation is the sincerest form of flattery, Bernard points out it can be more trouble than anything else. Recently an offshore manufacturer did a copy-cat job on Happy Trails line of luggage and Bernard has been besieged with repair requests from unhappy consumers of that inferior look-at-me line. There�s no secret to Happy Trails success. It�s all right there in front of you. Top quality gear made in the US by people who have a passion for riding and adventure.